Just three left! I’m embarrassed to admit, however, that your name. nearly didn’t make it onto this year-ender. As I noted a couple of months back, I’ve never been a big Shinkai Makoto fan, largely because his films have always felt somewhat ‘cold’ to me. His latest offering has definitely changed that—after I caught it for the second time when Madman brought it Down Under, it squeezed a couple of the other candidates that I’d been considering off this list. I just loved seeing Mitsuha and Taki find each other once again. 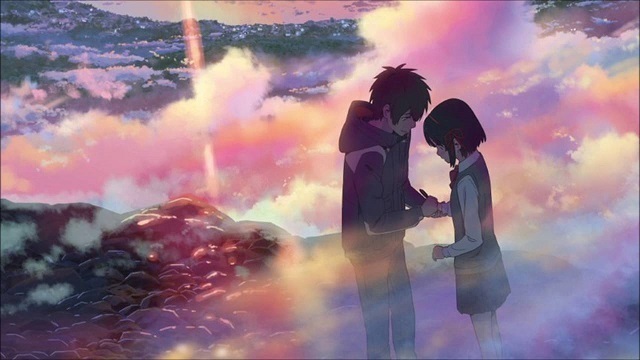 But given how the fandom’s focus on ‘romance’ has driven me crazy in recent years, why did I like your name. this much? I’m not actually sure, to be honest. I’ve been listening to some podcasts about screenwriting in the US TV industry, and with regards to romantic plots, the writers always emphasise ‘chemistry’. But they also emphasise that the chemistry doesn’t have to be sexual. This echoes a point that I’ve seen several Japanese writers (and Joss Whedon) make over the last few years, which is that they want to write about ‘strong, interesting relationships’ that aren’t necessarily sexual. To me, what these writers are drawing attention to is the fact that strong relationships aren’t built on physical attraction, at least, not alone. The most important aspect is actually the emotional connection, which sees the two people in question inspire each other to be better versions of themselves. And that’s how Taki and Mitsuha came across to me. For instance, when Mitsuha stumbles and falls, and lies on the ground fearing that her efforts will be in vain, the message Taki has left on her hand gives her the determination to keep going. In most shows, scenes like this would have me rolling my eyes—and I think this one did the first time, because the tumble was too anime-like for my liking. But that second time around, that look on Mitsuha’s face as she picked herself up again said it all. And that’s why, despite my growing apathy for the English-speaking fandom’s obsession with romance and romantic relationships, my tenth love letter to anime in 2016 goes to Mitsuha and Taki’s uplifting love story.